Race to the Top (RttT) reforms in States around the nation have initiated changes in the way teachers are evaluated and in the way new teachers are certified. The focus of this chapter is on sets of video-based action research studies aimed at analyzing and assessing classroom teaching performances and evaluating program effectiveness in a Professional Development School (PDS) partnership setting. The studies were part of a larger longitudinal research project begun in 1998. 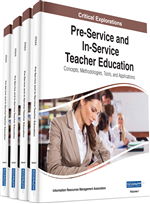 Authors present selected sets of studies as exemplars of a model research approach for continually changing and improving classroom teaching and the PDS's integrative pre-and inservice teacher education program. Readers are provided with the research and inquiry questions of the studies, key findings, and how findings were used to provide evidence of program effectiveness. Race to the Top (RttT) reforms in States around the nation have initiated changes in the way teachers are evaluated, certified, and in the way effective teaching is defined. In August of 2010, it was announced that New York State was one of nine States to have won the second round of the Race to the Top (RttT) competition (U.S. Department of Education, December 2010).1 An important part of New York’s application, as well as other State-applications, was the passage of legislation that required the establishment of a new and comprehensive evaluation system for teachers (U.S. Department of Education, January 2010 and March 2010). Improve student learning and achievement. Without a doubt, teacher preparation and teacher evaluation along with individual performance assessments of teaching effectiveness are now being connected to student learning. The focus of these reforms is on having pre-and inservice teachers demonstrate their performance ability to effect student learning, growth and achievement. With the implementation of new state evaluation systems, teachers receive a “composite effectiveness score.” A composite effectiveness score represents one of four or five progressive levels of performance or ratings. For example, in New York State such terms as “highly effective,” “effective,” “developing” or “ineffective” are applied as ratings to an individual’s performance. Selected frameworks of teaching that include rubric-narratives and ratings are used as major assessments to reflect a teacher’s level of effectiveness along with his or her ability to foster student growth as measured by increases in test scores.